This morning I decided to drive around North of Redcliff to see if I could turn up any early shorebirds. Mack and I had planned to go birding later on in the day, but he wasn't answering his phone as he was obviously sleeping in so I decided to go without him. There were lots of Western Meadowlarks singing and few species of waterfowl about. Mallards, Northern Shovelers, Green-winged Teal and a pair of Tundra Swans were on the small ponds in the fields. Unfortunately the only shorebirds I found were a couple of Killdeer making a lot of racket around the ducks. I started making my way back home along Range Road 70 when I came across a farmyard that had a lot of bird activity. There were several American Robins, Slate-colored Juncos, American Tree Sparrows, Common Redpolls, and one bird that I couldn't quite put my finger on. 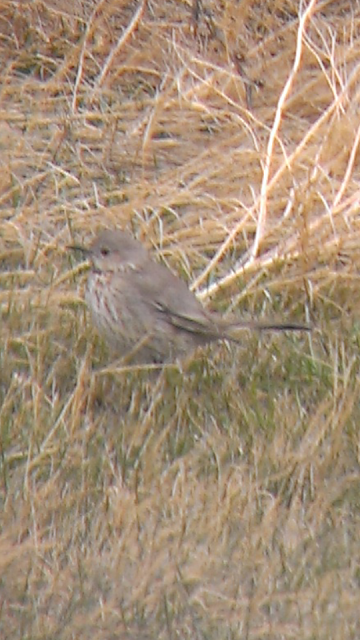 The bird looked rather thrush like but had streaking along its flanks and always held its tail in an upright position. Sage Thrasher crossed my mind, but I quickly ruled that out as being too unlikely. The bird was exceedingly boring looking from a distance and even looked too grey to be a Gray-cheeked Thrush (which I tried to turn it into multiple times). The problem was that it was just too far away to make a positive ID. Eventually it came a bit closer and I took a very poor shot of it with my cell phone through my binoculars. I sent the picture to my friend Ilya who quickly replied saying it looked thrasher-like to him and gave me a list of field marks I should be looking for. Eventually the bird flew reveling white tips to its tail feathers which ruled out any species of thrush. It landed in some bushes and gave out a very short but thrasher sounding song. Eventually the landowners pulled up and they graciously allowed me to walk in their yard which let me get very close to the bird confirming it truly was a SAGE THRASHER! I snapped a few photos through my bins and quickly reported the sighting on Albertabird. About half hour later Mack and Kristen arrived at my house and I drove them back to the farm where the bird was feeding exactly where I left It. Sage Thrasher was a nice surprise when the best bird I was hoping to see was a Greater Yellowlegs. On Tuesday I'm hoping to chase the Brambling being reported near Beaver Mines so stay tuned. That is a pretty cool bird to see in Alberta! Good luck on the Brambling chase. Waterton Trip and Brambling Chase!